Your nails are not just an after-thought. They are one of the things that people notice about you. That is why we strive to provide the highest quality nail and skin care service. We believe quality service can only be achieved with quality products and we only use the best available. We make sure to disinfect and sanitize our tools before each and every customer. 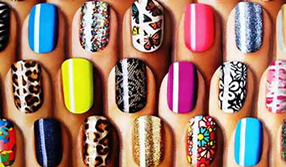 We use name brand high quality nail polish so that your nail color will look great and last. Nail tech specialist for over twenty years, acrylic tips, solar nails, manicures and pedicures. Joan can do your regular needs and also special occasions.